The La Madeleine Croque Monsieur is a fancy ham and cheese sandwich. If you have never had one, you should try one of these amazing ham and cheese sandwiches. If you are lucky you have tried a La Madeleine Croque Monsieur before, if not, you can enjoy this favorite menu item that is served. If you like Swiss cheese and ham sandwiches you are in luck. In reality, this is a ham and cheese sandwich that has the classic French Mornay cheese sauce poured over the top of the sandwich. The sandwich is then broiled until the cheese begins to brown. La Madeleine uses their honey wheat berry bread for the sandwich. You could choose any bread that you prefer. Traditionally this sandwich was made with a sweet bread like a brioche. Again, you can use the type of bread you like the best. For this recipe I like to use my toaster broiler oven, I simply lay the buttered sandwiches directly on the rack so both sides of the bread brown at once. When I go back to cook it the second time I lay the sandwich onto a baking sheet, and then add the cheese sauce, and a touch of additional cheese before placing under the broiler for the second time. Never fear, if you don’t have a toaster broiler oven, chances are your oven has a broil feature. You may want to move the rack closer to the heating elements for optimal browning. 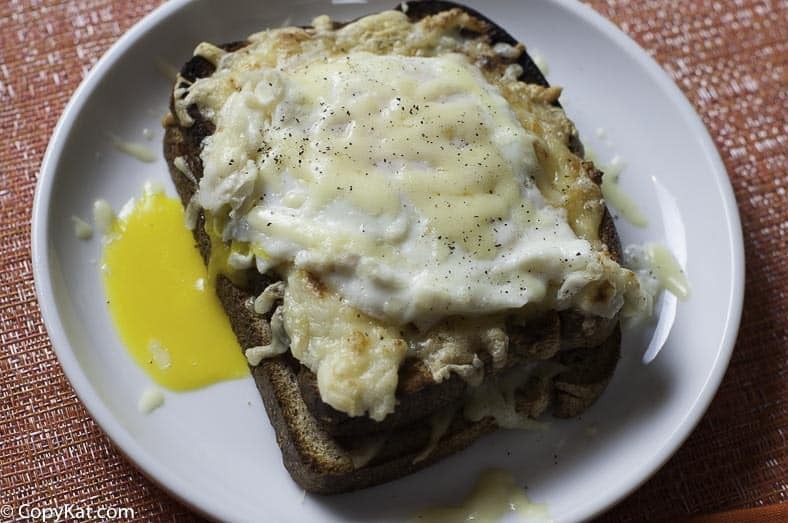 There is another variation to this sandwich, La Madeleine does not serve this one, but it is simply the Croque Monsieur sandwich with a fried egg added to the top. Love having a fancy brunch? Why not try some of these favorites? Enjoy this fancy ham and cheese sandwich. Assemble two sandwiches with 4 slices of ham, and 1 ounce of Swiss cheese. Butter the sandwiches with 1 teaspoon of butter per sandwich. Either broil the sandwiches in a toaster broiler oven or toast in a pan. To make the sauce heat together 1 tablespoon of butter and 1 tablespoon of flour in a small saucepan. Stir the flour and butter in the saucepan over medium heat. Cook the roux for about 2 minutes. Gradually add the milk in small amounts. Stir the milk in until the sauce is smooth and creamy. Once all of the milk is added add the cheese in small amounts. Add in a pinch of black pepper. When all of the cheese has been added and it has melted through spoon 2 to 3 tablespoons of sauce over the toasted sandwiches. Sprinkle a bit of cheese over each sandwich and place the sandwich back under a hot broiler until the cheese begins to melt and brown. 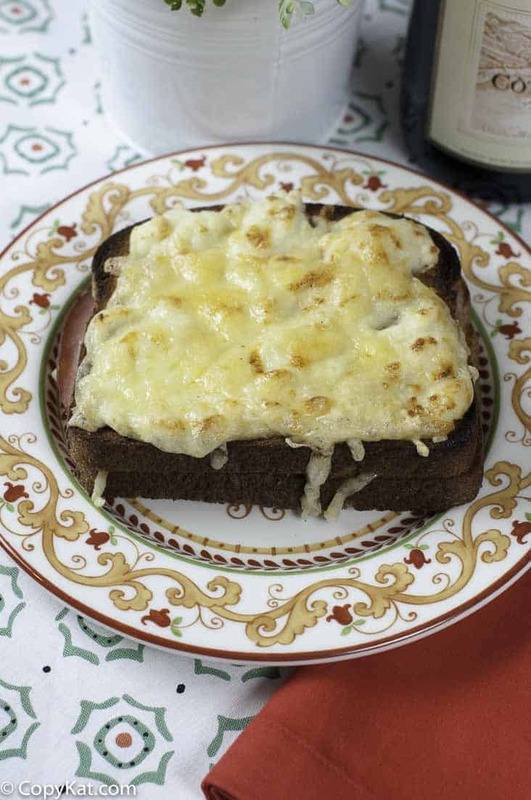 I often make Croque Madames (when you add the egg) with a cheater bechmel sauce, but will have to try your recipe. Sounds great! Stephanie – Do you have any recommendations for other cheeses that might work well in place of the swiss? Oh my! Being a swiss cheese lover, I will be in Heaven while eating this gem. Thanks Stephanie! I am currently in French culinary school, I think it is our cheese of choice there!